Introduction: Do you want your heart to break? Then, read these two parables about the Israelites rejection of God. The first is contained in Psalm 80. The second, in Isaiah, is called The Song of the Vineyard. Although written at two different times in Israelite history and by two different men, both parables are a cry of anguish from God directed to his chosen people. These parables identify God as the gardener and Israelite as his vineyard. Back Story: After the death of King Solomon, the Israelite kingdom divided (c. 930 BC). The Northern Kingdom, called Israel, included 10 tribes. The Southern Kingdom was known as Judah. At times Judah included both the tribes of Judah and Benjamin. At other times, Benjamin seemed more aligned with the Northern Kingdom. Levite towns were located in both Israel and Judah. The first Northern Kingdom king introduced idol worship, which was embraced by much of the population. After 200 years (c. 722/721 BC) Assyria conquered the Northern Kingdom. Most of its inhabitants were exiled throughout the Assyrian Empire. In the Southern Kingdom, Judah, descendants of King David ruled until 586 BC. Judah followed much the same path as the Northern Kingdom, albeit over a longer period of time. Judah turned from God to worship a myriad of idols. Jerusalem fell to the onslaught of the Babylonians and most of its citizens taken captive to Babylon. Interpreting Destroyed Vineyards: Isaiah declared, “The vineyard of the Lord Almighty is the nation of Israel, and the people of Judah the vines he delighted in. And he looked for justice; but saw bloodshed. God looked for righteousness; but heard cries of distress” (Isaiah 5:7 NIV). The spiritual interpretation for both Psalm 80 and Isaiah 5:1-6 is that there are consequences of sin. The consequence of Israel’s and Judah’s sins was that God abandoning them. God removed his protection from both kingdoms with the result that both was attack and ruined. In their pride both kingdoms forgot that God was their hedge. They believed that their armies were protection for their borders and for their populations. In these two parables we glean another spiritual lesson: God’s judgment was proportional. After becoming a nation separate from Judah, Israel turned immediately to idol worship, e.g., Jeroboam set golden bull in Dan and Bethel and told his people that the bulls were the gods that brought them out of Egypt. Over 200 years, the nation’s population repudiated God almost completely. In response, God allowed the nation of Israel to cease to exist. On the physical or natural level, the parables of destroyed vineyards included preparing and protecting a vineyard. Usually, ancient Israelites enclosed vineyards with fences. Often farmers dug a ditch around the vineyard. The earth from the ditch was thrown on the inner side of the ditch. Fence posts and thorny plants were placed on the berm. At other times, a wall of stones or sun-dried mud took the place of the earthen fence with its thorny plants. God built a watch tower to protect his vineyard Israel; the watchman could see marauders coming from far away. The vineyard was planted, “with the choicest vine” (Isaiah 5:2). 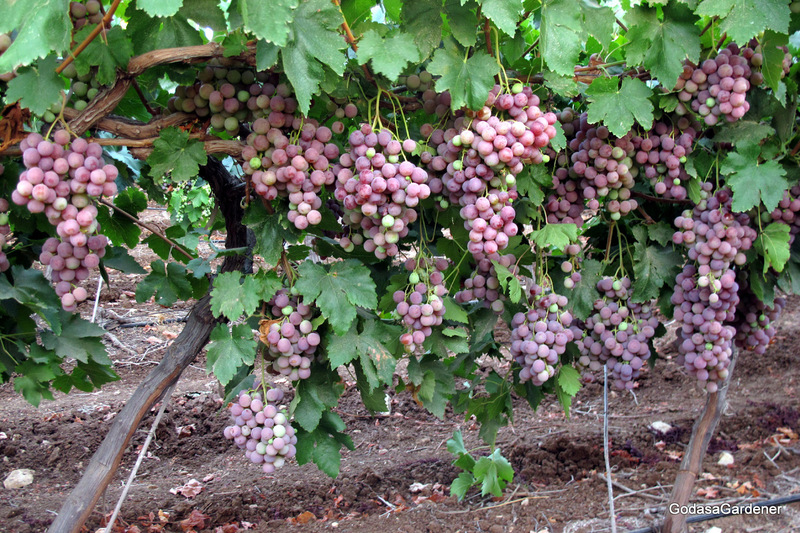 Farmers traded for the best vines available or purchased the highest quality vines that they could afford. As the vine grower devoted himself to the vineyard and grapes, God devoted himself to the Children of Israel. He did everything possible to select good vines, protect them, and promote good growth in them. When God anticipated a yield of good grapes from his vineyard, he got only bad grapes. They produced disobedience, rebellion and idolatry. God is so disturbed that he asks: “What more could have been done for my vineyard than I have done for it?” (Isaiah 5:4 NIV). Reflection: The consequence of Israel’s and Judah’s sins was that God abandoning them. What do you think will be consequences of the United States of America’s rejection of Godly ways of living? If you want to learn more about plants in the Bible, go to my website www.CarolynRothMinistry.com and check out my two books devoted to plants in the Bible. Ascertain what God wants us to learn from them.